Bridgetown, Barbados – Fourteen teams are registered for the GAIA T20 Night Cricket competition that bowls off on Sunday Night, September 27th, at the Rices Playing Field. A press briefing was held at the airport yesterday to make the announcement by Corporate Communications Specialist, Keith Goddard who said GAIA Inc was pleased with the interest for the fourth straight year. 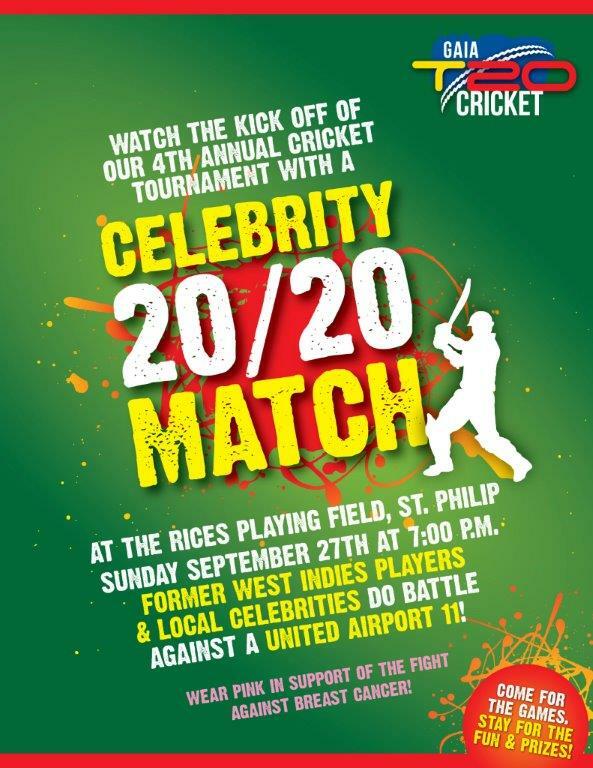 A highlight of this year’s competition is the opening match on the night which features a Celebrity Eleven vs an Airport United Eleven. The featured game is in honour of Breast Cancer Awareness Month which starts on October 1, 2015. Of the fourteen teams, eleven are from the airport y and three are from surrounding communities. This year the teams are divided into two zones of seven teams each. ZONE B: CAH RAMP, HARLINGTON, FIRE SERVICE, COURTESY, STOUTES CAR RENTALS, FOUR ROADS, GAIA INC.